I don't understand your steadfast insistence that both leagues implement the DH. After all, in the NBA, it works just fine to have a 3 point line in the Eastern Conference and a 4 point line in the Western Conference. And it's no problem in the NFL to have the AFC start 13 men on offense while the NFC sticks with 11! Clearly, it's extremely normal to have two leagues in the same sport play by such drastically different rules. Now, no more DH talk. We have reached our quota. I get that Boras has a lot of high-profile clients, and there seems to be general agreement about the desirability of Bryce Harper, but it seems Boras pitches one of his FAs as a "Generational Talent" every year or two. While perhaps it ultimately gives a boost to a few guys like Strasburg and JD Martinez, I can't help wondering if it costs a guy like Harper because teams start to roll their eyes when the Boras hype train starts rolling. Certainly Moustakas (obviously not on the same level as Harper, not meant to be an analogy) didn't get that big deal before 2018; any chance it's because Boras' pitch can sometimes backfire a bit? I think it has a lot more to do with Boras than the player. As much as Boras tries to "sell" teams on his guys, front offices know what they think of a player. They have their own projections. They are not as interested in what the player has done, and more interested in what their analytics say the player will do. There's a reason Boras targets owners. His selling points have a better chance of sticking with them. Ben, love hearing the responses from you, DG, and The Commish about Cardinals' baseball. If Machado, Harper, and Donaldson sign elsewhere and a trade for Goldschmidt doesn't happen, where do the Cardinals get their big bat for the lineup? Good question. There are only so many lineup-altering bats out there. There are many decent bats that can be pitched as lineup-altering. How as a Sportswriter you get chosen to pick Rookie of the Year? By being a member of the BBWAA. Two writers from each NL city with a chapter get a vote. stltoday.comBoth promising starters were deserving. Here's why I picked one over the other. Do you expect smooth sailing for the MLS stadium tax credits vote in the city council today or do you think any councilpersons will hijack the vote to get a personal project funded? Smooth sailing for sports ventures in a post-Rams board of aldermen is probably a pipe dream, but I don't see why there should be significant hangups here. The land is blighted. The project is primarily privately funded. There is a plan for renovation and potential deconstruction if things fall apart down the line; something that the dome lacked, for example. The asks are not much different from any business that is looking to coming to downtown. I think the group feels good about the way things are moving. We'll see. Do you have an opinion on the Jimmy Butler trade? None, other than it's good the Heat did not add him. Josh Richardson is a baller, and he can star there. One of my favorite athletes to cover. And one of Cuonzo Martin's best recruits. How is Ozuna projected for 2019? Steamer has him slashing .288/.345/.490 with 27 homers and 93 RBIs. Pretty good. The shoulder is the key. If that's right, he should slug. And if he slugs, we won't spend much time talking about his arm. Who do you suppose is the leader in the clubhouse right now on track to start opening day 2019 for the Cardinals? Why wouldn't he be the one? I don't understand why everyone is so intent on giving out a 10 year contract to anyone! When do these contracts EVER work out??? I don't know that anyone loves the notion of a 10-year contract. No team is doing cartwheels when that is signed off on. It is, though, the cost of doing business when you are dealing with elite players who are entering their prime through free agency. The dollars being paid to elite players is not going to shrink, not with the league making more and more money. Teams that can abstain will have to develop their own elite players. Competing annually and winning annually means the Cardinals don't get the best shot at drafting potentially elite players. If you want elite, something is going to have to give at some point. If not, you are just waiting to catch lightning in a bottle again. Hey BenFred, do you think the Cardinals should trade for a third baseman or corner outfielder and use their prosepect depth OR sign a player like Harper, Moose, Donaldson or Brantley? If the Cardinals add any outfielder, I think it will be Harper. I don't imagine them pursuing a non-Harper outfielder, and that's if they decide to be serious players for Harper. Is Mikolas someone you believe is already a higher priority to try and extend ideally before the start of the 2019 regular season? He would be a great candidate to consider for an extension, yes. Seems to love it here. He is truly beloved by his teammates. He could be a good shepherd for the younger arms who are climbing the ranks. I like this idea. Ben -- I am pleased with how Mizzou has responded this week and agree it wouldn't make sense to replace Oden unless the team just totally falls off the rails during these last two weeks, but forgive me for not calling this season a raging success, especially considering this is a veteran team. The sting of those losses to South Carolina and Kentucky still sits with me. South Carolina is a mediocre team that was without its starting quarterback. Kentucky probably was overrated and Missouri lost that game due largely to incompetence. It has a chance to be a good year. It could have been a great one and given Missouri something to build on going into the next year. Does it make me a bad person to feel a little "meh" about this year? I think we can table the talk of Odom losing his job. They can afford one loss in their next two games, though that would be disappointing. They should beat Tennessee and Arkansas to finish with four consecutive wins. Tennessee seems to be the only real threat. I thought the Vols hit their high-water mark with a win at Auburn.They proved me wrong against Kentucky. What a terrible loss for the Wildcats. As for the season analysis, let's see how it ends. If Mizzou wins out and wins a bowl game, that's nine. That's pretty good. Then, yes, you would probably be a bit negative to hang onto the two losses that should have been wins. But, the nature of those games will never not sting for Mizzou fans. This might be a what-if season, but let's be clear: Nine wins is big for a third-year Mizzou coach, period. I said let's see how it plays out after the Kentucky loss, and I was being too optimistic. I'll say let's see how it plays out now, to keep from being too optimistic. Do you think Alabama's dominance is good for college football? What about Golden State's dominance being good for the NBA? I don't really care much for that argument. Teams should get better and beat them. That would solve any problem. If cards have talk with D backs for Goldy is there a chance for cards to talk with him and his agent on signing long term before they would make a trade for him? I've never understood why a sign-and-trade is in the best interest of the player. Wouldn't you want a season in the new place to see how it fits? I'd like to see the Cards sign a couple lefties for the bullpen (Wilson, Ship? ), trade for Lamb, then maybe sign the Japanese lefty. Maybe they could package some of their depth for some other upgrade. I like that better than spending $350M for 1 player and hoping he doesn't get hurt, like he usually does. Because relievers are the bastion of good health? Most relievers are relievers because they could not stay healthy or effective as starters. I'm not sure you want your big offseason moves to be headlined by bullpen tinkering. 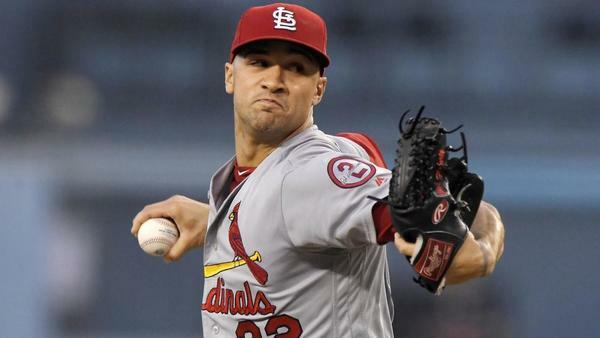 Again: The Cardinals are going to make bullpen moves. This is going to happen regardless of other moves. Again: There is a ton of evidence that suggests betting on relief pitching is the riskiest gamble a team can make. If the "major" moves the Cardinals make this season are bullpen-related, that's disappointing. Ben - Harper is a good baseball player, but he is not elite. His career BA is .279. He averages 26 HRs. Most defensive metrics rate him average. He has had one "elite" year when he won the MVP. He is not worth $35 million dollars a year. I agree the Cardinals owners need to spend to improve the team. However, pushing all your chips in on Harper for 10 years seems like a waste of resources. In the event of injury or lack of performance on Harper's part, the Cards would be hindered for a decade. I'll share two stats I read recently that jumped out. They were from a Washington Post story about the Boras pitch for Harper. The only active players who had more homers than Harper by age 25: Pujols and Trout. The only other player in the past decade to post an OPS of 1.109 for an entire season: Pujols. He's 26, and should be on the cusp of the best seasons of his career. Appreciate the chats, BenFred! Name that has seemingly disappeared from any rumors and the best fit for the Birds is Nolan Arenado. Guy is an absolute beast and would become a superstar when he took them back to the Playoffs. Thoughts? He would be a great fit. But I'm not sure why the Rockies would move him. Talk in Colorado is they want to sign him long-term. Thanks, Beth. Good work, kiddo. Does Mizzou hoops have a discernable offensive philosophy? There are no more outside shooters (although Mark E. Smith may be one) so last year's "pass until a senior gets open behind the arc" won't work. I wrote about it last week. Without Jontay Porter, they want to play through Jeremiah Tilmon. Get him paint touches, let him create double teams, then have him kick it out for guard to drive and shoot. If he does not handle that role well, it's going to be ugly. What do you make of Mizzou's win on Saturday? Yeah it's a win but it was Vandy and they almost lost. Also, how is Mizzou going to juggle the KC and STL game playing in the future? KC got a game in 2015 (and isn't a future game scheduled there) when will STL get a shot? For basketball, are any games upcoming for KC? I saw there is no game scheduled there this year but STL obviously has bragging rights. When it's an SEC game, a win is a win is a win. The Tigers didn't get participation points for keeping it close against South Carolina and Kentucky. The should not get dinged for finding a way against Vanderbilt. In fact, what they did to beat Vanderbilt -- the fourth-down stop, the PBU on the final play, the final scoring drive -- were examples of they kind of big plays they could not make against South Carolina and Kentucky. So, good win, all things considered. As for the KC and STL, I'm not sure the university views it as something it has to keep equal. It made sense to play in KC when there was the game against Kansas. It still makes sense to play in STL when there is a basketball game in Illinois. It would make sense to play in STL when there is a football game in Illinois, but the shift at the dome changes things. Maybe Busch becomes an option. I'm not sure Mizzou has interest in playing in Chicago. It could stick to campus-campus. I don't see the upside of Mizzou playing regularly i n KC if the opponent is not based on that side. Maybe I'm wrong. Is Philly the most aggressive franchise on the Bryce Harper market?